Nuclear sites become contaminated with radionuclides due to accidents and activities carried out without due consideration for the environment. Naturally-occurring radioactive materials (NORM) released by industrial processes such as coal power production and fertilizer manufacture may also require clean-up. 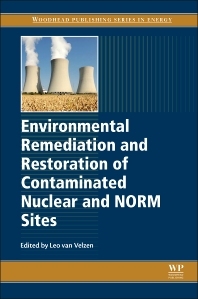 Environmental remediation and restoration aim to reduce exposure to radiation from contaminated soil or groundwater. This book provides a comprehensive overview of this area. Part 1 provides an introduction to the different types of contaminated site and their characteristics. Part 2 addresses environmental restoration frameworks and processes. Part 3 then reviews different remediation techniques and methods of waste disposal. Leo van Velzen, NRG Nuclear Research and consultancy Group, The Netherlands.